Well-known actors, CEOs and fashion designers are accused of paying up to $6.5 million to fake exam scores and get coaches to declare their child a sports star. Studying in America is expensive - student fees often total more than £100k over four years - and taking out student loans cause a lot of young people to struggle with debt. (Unlike in the UK, American graduates have to start paying their debts back, with interest, even if they are unemployed or in a low-paying job). But none of that stops universities being full: America currently has more graduates than ever, at almost a third of the population. A major reason is that getting a degree usually significantly ups how much money you earn over your lifetime. And that boost is especially big if you get into one of the top, or Ivy League, schools. After ten years, the average Ivy League grad is earning $70,000 a year. That’s almost double the average salary of other graduates ($34,000). 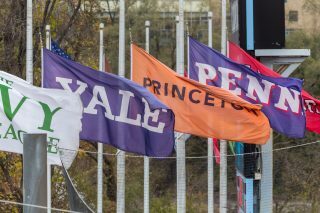 The top ten percent of Ivy Leaguers earn hundreds of thousands of dollars a year before their 30th birthday. So you can sorta see why (a) some people thought it was worthwhile to drop a cool mill or so on bribing dodgy university officials to accept their less-than-precocious offspring, and (b) wannabe Ivy League students who didn’t pay bribes and didn’t get a place are super pissed off about it. Read our explainer on: human capital. So how do we get what we need to live? Our livelihoods are our own personal answer to that question, whether it be job in a factory, setting up a start-up, or taking time out to travel. But the economy we live in affects the choices we have in setting up our livelihoods, and we rely on so many other workers around us to be able to do what we do… how do we get the balance right?